Whole world knows that you dream of your big day all your life! You want it as beautiful and as fairytale-like as possible! But… sometimes your budget doesn’t allow you to make things as per your choice! Your wedding dress may also have to undergo a consideration from your budget point of view. But don’t worry! There are ways to get discount wedding dresses which are as elegant as the most expensive ones are. Here are they! The first and foremost way to find an answer to every question today is internet. If you put a search term in Google, like “discount wedding dresses” or “cheap wedding dresses” you will get thousands of results telling you about places to get cheap wedding dresses. Of course, if you are more in favor of buying the gown personally, you should find a local store – but that is also not a problem. You can put a search term like “discount wedding dresses (your locality)” and again get hundreds, if not thousands, of results. Narrow down your search more depending upon your access to the areas in the search results, your budget, your particular requirements, and other such criteria. Finally, enlist stores which are most convenient to you to access and having an impressive collection of discount wedding dresses. This will make it easy for you to get your dream wedding dress at discounted price. And if you don’t have a problem of buying online, then you have still wider choice and you can get literally unlimited places to buy a cheap yet elegant wedding dress. Similar to stores selling or tailoring wedding dresses, there are several stores, online or brick-and-mortar which rent wedding dresses. If you are a bride, who thinks that the wedding dress is just a one-time showoff and nothing else, renting a dress should not be a problem for you. Approach your recently married female relatives and friends. If they are ready to hand out their wedding dress, you can get a dress for free or for some nominal charges. Of course, you can choose a friend or relative whose wedding dress you had loved the most, so that you can wear the dress of your choice. Buying a dress off the rack is a great way to get a good dress at low price. Buying off the rack means buying a sample dress in a bridal store. Bridal shops usually carry sample dresses of a single size. When a bride orders a dress, they will create a customized dress just for her. However they also sell the sample dresses too at a discounted price if you need only some minor alterations. Why not explore an outlet bridal store just like you explore a regular outlet for your other needs? You can get your hands on a gorgeous dress in such a store, no matter if it is last year’s trend! Who will know it if it looks amazing on you? Leave away fancy bridal boutiques – explore bridal chains instead. Here you will get some incredible deals on dresses, even as low as $99! You don’t have to spend a fortune on your wedding dress to look amazing. 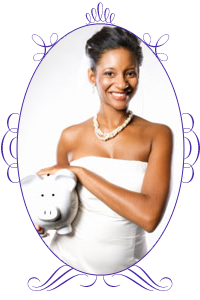 So many resources are available to you to save money on your dress and still look ravishing on your special day!